Essen BioScience, a pioneer and leader in the field of cell-based assays and instrumentation used for drug discovery and basic research, has launched the IncuCyte® S3 live-cell analysis platform for real-time, automated measurements of cell health, proliferation, movement and function directly inside a standard incubator. In sharp contrast to manual monitoring and analysis, real-time live-cell analysis using the IncuCyte S3 automates data capture and cell assessment delivering new insights and understanding into biological processes. Cells can be continuously monitored and data collected around-the-clock and at precise, regularly scheduled sampling intervals for days, weeks, or months, while remaining unperturbed in a physiologically relevant environment. 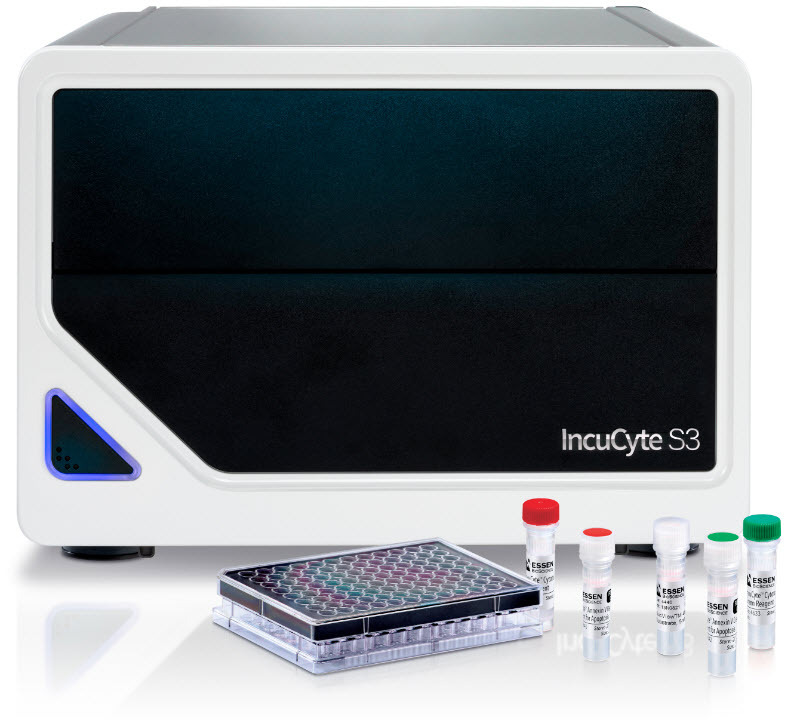 The IncuCyte S3 platform includes instrumentation, reagents, consumables and analytical software to perform kinetic, image-based measurements. These measurements provide more physiologically relevant data and deeper, more meaningful insights into active biological processes and cellular function than what is achievable with conventional endpoint assays. The IncuCyte® system and reagents are non-perturbing to cell health and morphology, further reducing potential artifacts in user experiments, and combining information-rich, image-based analysis with the convenience and throughput of microplate assays. The S3 offers a completely redesigned user interface, enabling even first-time users to set up an experiment within minutes and then walk away as the IncuCyte automatically collects and analyzes images. In addition to improving productivity for individual users, the S3 accommodates multiple users and applications seamlessly, allowing multiple users to run different applications in parallel. Furthermore, data is accessible remotely to any user via unlimited, free networked licenses. Multiple T-flasks or up to six 96 or 384 well microtiter plates fit within the IncuCyte S3 system, increasing productivity and allowing different applications and assays to be run simultaneously. More than 4,000 images can be collected per hour, converting traditional endpoint assays to a kinetic format for studyingmovement, migration, apoptosis and other cell behaviors. Images from a 96-well experiment can be viewed simultaneously, then converted into movies, metrics, and graphs that are publication- and presentation-ready with just a few clicks.